It's not just an excuse to fill your kitchen with the smell of Wine and warm Spices... although that certainly is a fortunate side-effect. Poaching is a process by which food is cooked in a gently simmering liquid. Poaching works best with firm fruits such as Pears, Apples and even underripe Peaches. The poaching process significantly softens the fruit. If you start with a soft fruit, you will end up with a mushy final product. By poaching fruit in a flavorful liquid, the fruit is infused with that flavor. A traditional Poaching Liquid usually includes Water, Sugar and Wine (either Red or White). That flavor can be further enhanced with a variety of spices. 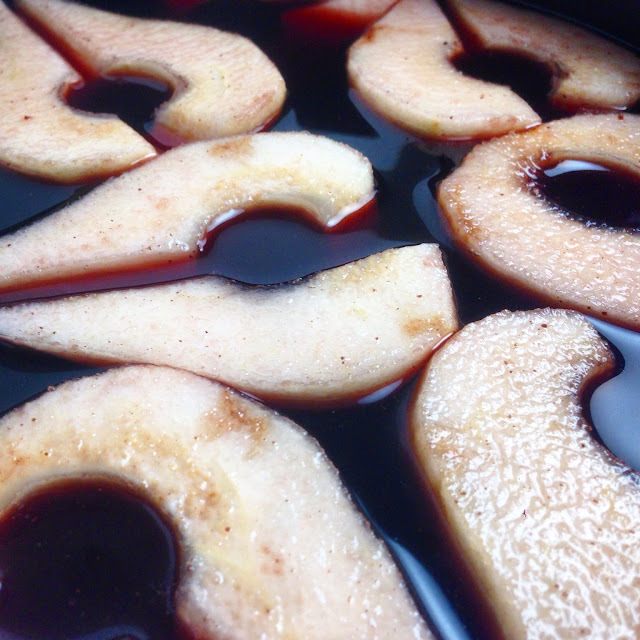 For Fall, it's all about Red Wine, Cinnamon, Ginger, Nutmeg and Cloves. But you could just as easily use lighter flavors like White Wine, Lemon Zest and Vanilla for a Summer variation. Poaching is also a great way to add sweetness to fruit. By adding more Sugar to the poaching liquid, an otherwise bland, underripe fruit can be infused with sweetness. That said, when using already sweet fruit, it's best to cut back or even eliminate the additional Sugar. Select your Pears. Do not use soft or overly ripe Pears. Even the gentle simmer of the Poaching Liquid may be too much for such fruit. Peal, halve and core the Pears. 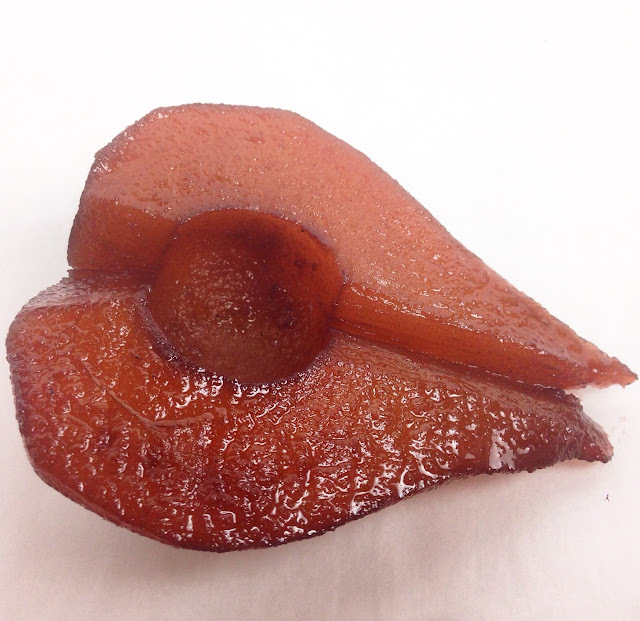 Unlike Apples, there is a thin, fibrous vein that runs up the center of the Pear to the stem. Make sure you remove this too. To prevent browning, place the cut Pears in a bowl of cold water with a little Lemon Juice as you work. The ingredients for the Poaching Liquid are largely a matter of personal taste. As a basic starting point, combine one part Sugar with two parts Water and two parts Wine (either Red or White). If the Pears are already naturally sweet, consider reducing the amount of Sugar. Conversely, if the Pears are somewhat flavorless or underripe, add more Sugar. Wine is optional. A simple syrup of just Water and Sugar can also be used as the Poaching Liquid base. However, Wine imparts a tremendous amount of flavor. If you do not want to use Wine, consider supplementing the Poaching Fluid with some citrus zest and/or juice to add acidity. The Poaching Liquid can be further enhanced with other flavoring agents. Vanilla and Citrus combine well with White Wine based Poaching Liquids. Warm spices such as Cinnamon, Nutmeg and Cloves work well with Red Wine based Poaching Liquids. Combine all of the Poaching Liquid ingredients in a large pot over medium heat and bring it to a gentle simmer. The fluid should never boil too rapidly. The Pears are gentle, and a rolling boil could break down the fruit. Add the Pears in a single layer to the simmering Poaching Liquid. Do not overcrowd the pot. Adding too many Pears will result in uneven poaching. 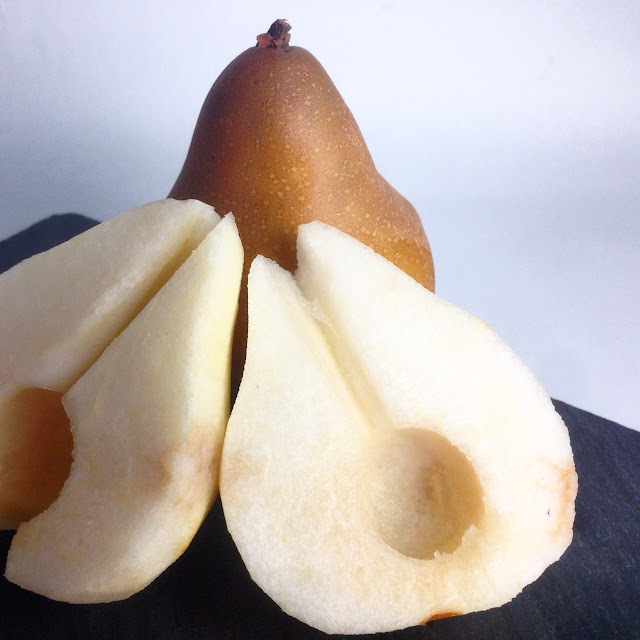 It can take up to an hour to poach Pears, particularly if the Pears are underripe. A lot of water will evaporate from a simmering pot over an hour. To reduce the rate of evaporation, and to trap heat and promote even cooking, cover the Pears with a parchment tent - a piece of parchment cut in a circle to rest on top of the simmering Poaching Liquid. 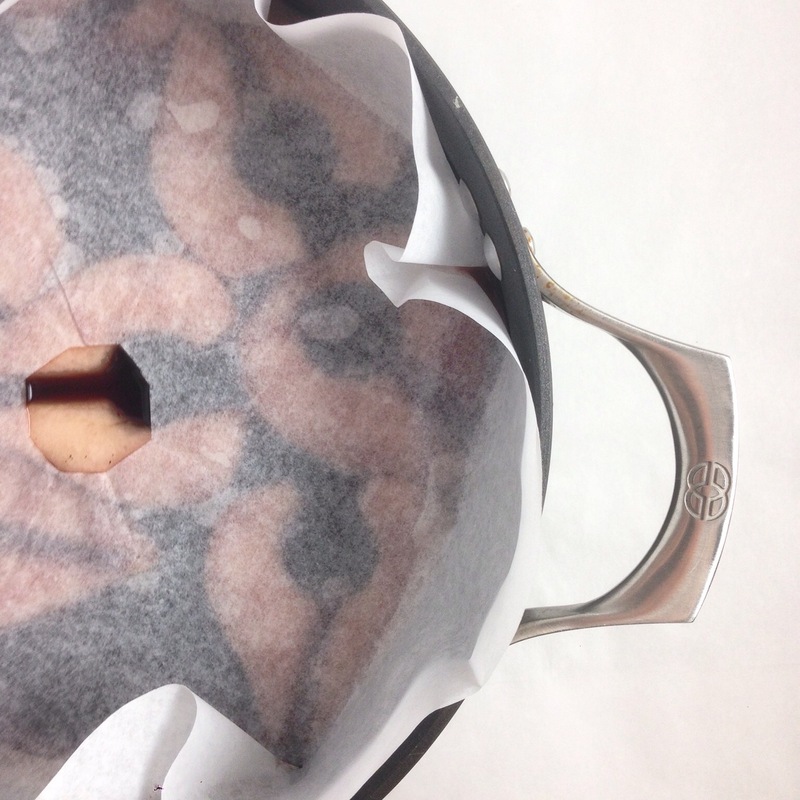 Cutting a small hole in the center of the parchment tent allows some steam to escape, keeping the parchment from rising off of the surface. 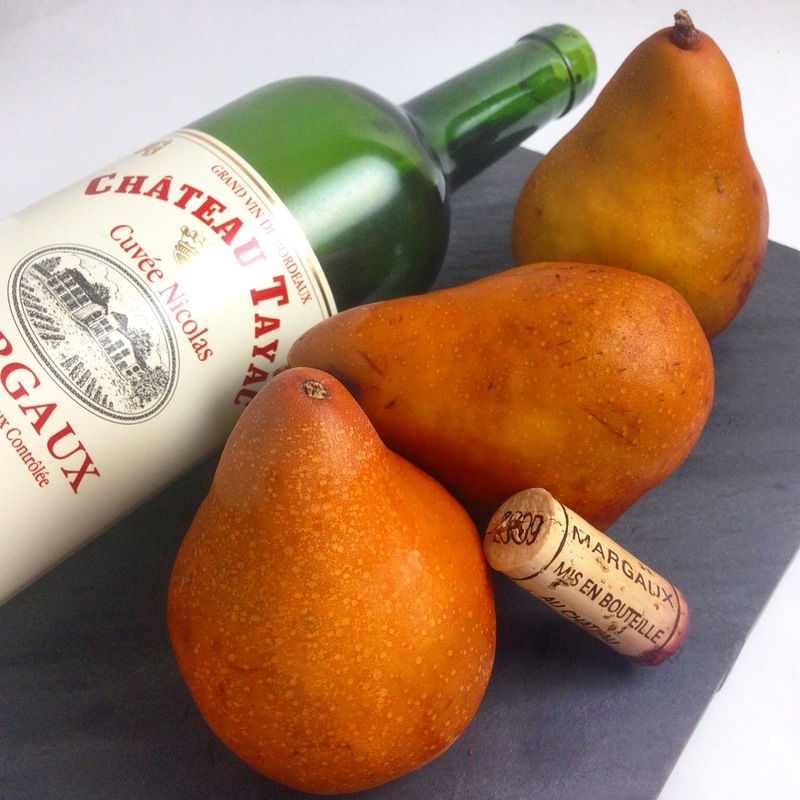 Poach the Pears until they are fork tender but not falling apart. The Pears should not be mushy. The required poaching time will vary based on the Pears that are use. For underripe Pears, the poaching process could take up to an hour. 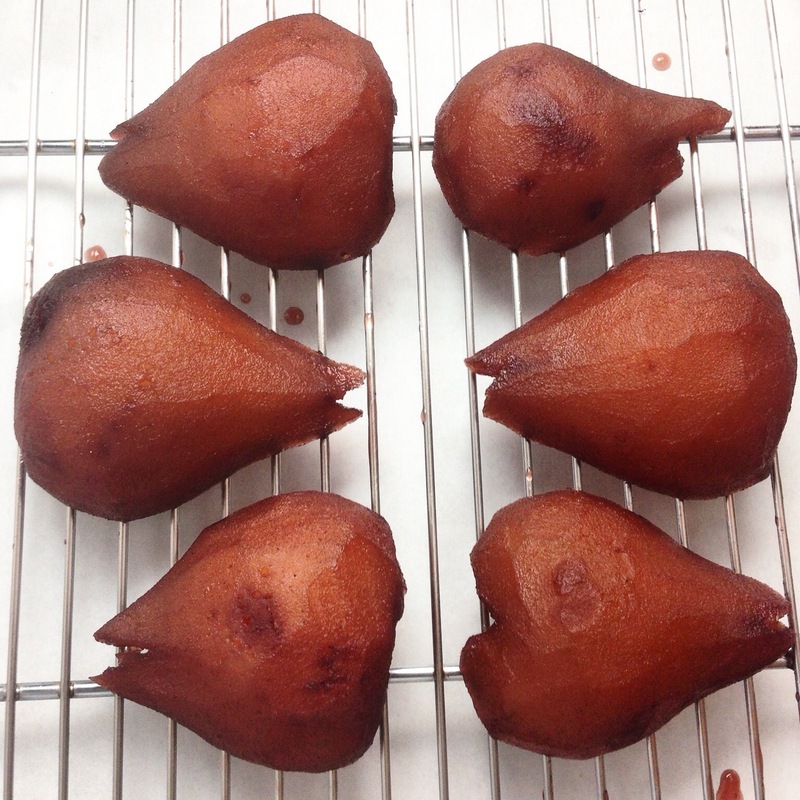 Remove the Pears from the hot Poaching Liquid and allow them to cool on a cooling rack. The Pears can be stored in the Poaching Liquid once it has cooled. The Pears will keep for up to a week when refrigerated in the Poaching Liquid. 1. Combine the Wine, Water, Sugar and desired flavoring agents in a large pot over medium heat. 2. 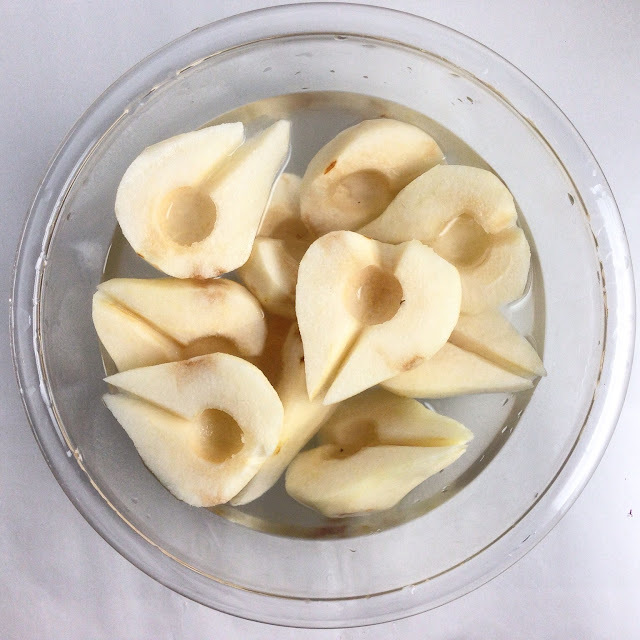 As the Poaching Liquid comes to a gentle simmer, peel, halve, core and stem the Pears. 3. Place the Pears into the simmering Poaching liquid in a single layer. Do not overcrowd the pot. 4. 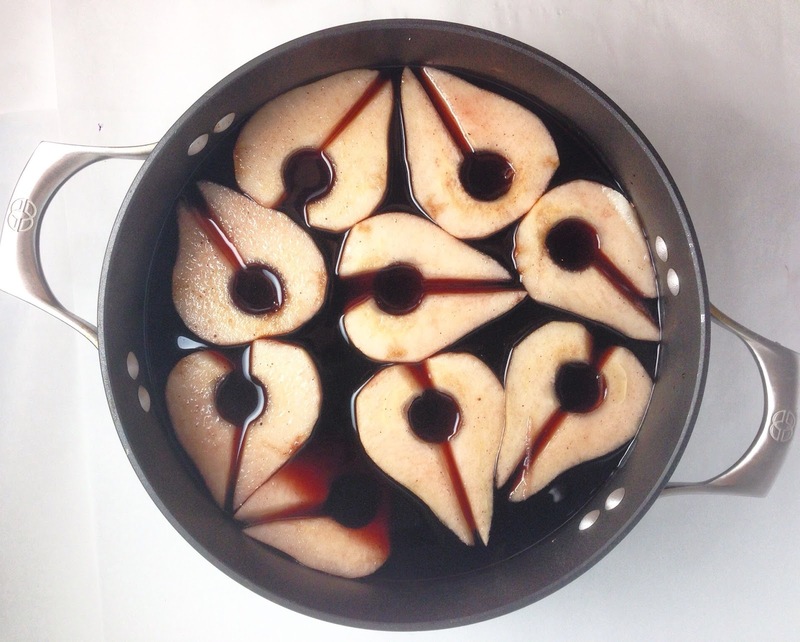 Place a parchment tent on top of the Pears and adjust the heat to keep the Poaching Liquid at a gentle simmer. 5. Poach the Pears until they are fork tender but not falling apart. Remove the Pears from the hot Poaching liquid and allow them to cool on a cooling rack. - The Poached Pears can be stored for up to a week when refrigerated in the Poaching Liquid.